At Southern California Veterinary Group of the Inland Empire, our highly experienced team of veterinarians and veterinary support staff have been helping educate our clients and win the fight against heartworms in cats since 1981. The importance of heartworm prevention for cats cannot be overstated. Once a cat has contracted heartworms, it cannot be cured. Therefore, preventive measures are absolutely necessary in order to keep your beloved feline friend healthy and safe. What Is Dirofilariasis, AKA: Cat Heartworm? Dirofilaria immitis is a blood-borne parasitic nematode (roundworm), commonly referred to as cat heartworm. Heartworms in cats are spread through mosquitos carrying cat heartworm larvae. The severity of heartworms in cats is directly dependent upon the number of worms present a cat's body, the duration of the incubation, and the response of the infected cat. Although heartworms in felines are less prevalent than in canines, feline heartworms are still a dangerous disease that has been on the rise in America. The risk of heartworm is about equal for both indoor and outdoor cats. If you do not use preventive medication, the risk of contracting cat heartworm disease exponentially increases. This is why preventive cat heartworm medication is so important. On occasion, an apparently healthy cat may be found dead, or may develop sudden overwhelming respiratory failure. In these cases, cat heartworm disease may be diagnosed on a post-mortem examination. We can easily prevent cat heartworm long before serious medical issues or life threatening emergencies develop by simply implementing preventive measures. How Are Cat Heartworms Transmitted? Upwards of 30 species of mosquitoes can act as cat heartworm transmitters. Mosquitoes ingest immature heartworm larvae, called microfilariae, by feeding on either an infected cat or dog. The microfilariae develop further for 10 to 30 days in the mosquito's gut and then enter parts of its mouth. When an infected mosquito bites a cat, it injects the heartworm larvae into the cat. The larvae then migrate and mature over a period of several months, eventually ending up in the right side of the heart and the pulmonary arteries. Once this occurs, they mature into adult cat heartworms, and can reproduce about six months from the time of invasion. Approximately eight months after the invasion, cat heartworm begins to produce a new crop of microfilariae that will live in the cat's blood for about one month. By the time this occurs, most cats begin showing symptoms of cat heartworm and the disease can become fatal very rapidly. A urinalysis, or the testing of a cat's urine. A heartworm antibody test determines whether or not a cat's immune system has been exposed to heartworms. This is a very sensitive test, and is usually employed first. A heartworm antigen test determines the presence of adult female heartworms. This is more specific than an antibody test, but not as accurate in all cases. Radiographs, or X-Rays, that allow us to view the size and shape of a cat's heart. This is helpful because many cats with cat heartworm develop enlarged pulmonary arteries, or have obstructions in the arteries leading to the lungs. Ultrasounds allow us to view the internal structures of the heart and surrounding vessels, in order to assess the condition and function of the heart. However, in some cats with low levels of cat heartworms, this test does not always yield accurate results. A white blood cell count can be measured in cats suspected of having contracted heartworms. Eosinophils are a type of white blood cell which occur in higher numbers when heartworm for cats is present, but can also indicate the presence of other parasites besides cat heartworm. Unfortunately, there is currently no viable heartworm medicine for cats that can fight off an active infestation. Therefore, if your cat is diagnosed with heartworm, we cannot cure it. However, while we cannot defeat existing heartworm disease with medication, this isn't necessarily an indication that they will die soon. While sudden death is possible, it isn't common. If your cat is diagnosed with heartworm they may still live a long life under the supervised medical care and treatment of your veterinarian. This may include anti-inflammatory treatments and medications to aid in breathing, similar to those used to treat asthma. The good news for cat owners and their feline friends is that reliable heartworm prevention for cats does already exist. Veterinarians strongly recommend that all cats receive monthly heartworm preventive medications in areas where mosquitoes are active all year round. Here in CA and because of our mosquito population, we highly recommend all cat owners adhere to this annual preventive medicine protocol. We recommend scheduling an appointment to discuss heartworm prevention for cats with us before your cat contracts heartworm. If you witness any symptoms that might be indicative of cat heartworm disease, please contact us immediately to schedule an appointment. 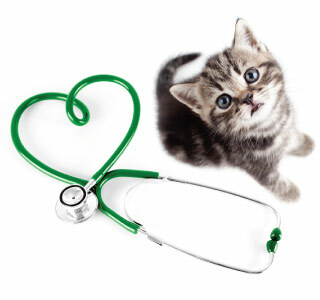 Our veterinary team will provide you and your feline friend with an effective cat heartworm prevention protocol.